Taking too much vitamin B12 can lead to side effects. Knowing the facts before you begin vitamin B12 supplementation can help you to make informed health decisions about the vitamins you choose to take. Consult with your physician before taking B12 supplements to treat a condition. 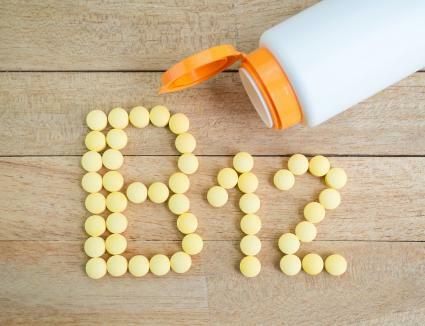 Knowing the facts before you begin vitamin B12 supplementation helps you make informed health decisions and determine if B12 supplements or injections are the right fit for you. Vitamin B12 is generally well-tolerated, even in doses well above the recommended dietary allowance (RDA), which is 2.4 micrograms daily for adult men and women. Because vitamin B12 is a water soluble vitamin and is excreted in the urine when consumed in excess, it's difficult to overdose on this essential nutrient. However, there are a few side effects to be on the lookout for if you're supplementing with vitamin B12 or receiving B12 injections. Is Too Much Vitamin B Risky? In healthy individuals, excess vitamin B12 likely won't cause problems. However, the University of Maryland Medical Center says if you have an eye disease called Leber's disease, B12 supplements can seriously damage your optic nerve. So always check with your doctor first, especially if you have pre-existing health conditions like Leber's disease before taking B12 supplements of any kind. While vitamin B12 hasn't been shown to cause cancer, Mayo Clinic suggests using B12 supplements with caution if you have a history of cancer. While B12's relationship to cancer requires further research, a 2013 study published in the Journal of the National Cancer Institute found cancer risks increased with higher B12 blood levels. So again, always check with your doctor before beginning a B12 supplementation regimen. When receiving B12 injections due to B12 deficiency or inadequate absorption of vitamin B12, you might experience side effects related to the injection. According to MedlinePlus, common side effects include diarrhea and a swollen-feeling body, while less common (more severe) side effects may include muscle pain or cramps, leg pain, weakness, extreme thirst, frequent urination, confusion, shortness of breath, coughing, wheezing, fatigue, fast heartbeat, swelling of arms and legs, headache, dizziness, red skin color, hives, rash, itching, and difficulty breathing. Talk to your doctor if you're experiencing any such side effects from B12 injections. Taking B12 nasal gel for malabsorption (pernicious anemia) can cause some of the same side effects as B12 injections. According to MedlinePlus, these may include headache, upset stomach, stuffy nose, sore tongue, weakness, bruising or unusual bleeding, muscle weakness, cramps, muscle pain, leg pain, extreme thirst, frequent urination, confusion, burning or tingling in hands and feet, sore throat, fever, chills, rash, hives, itching, and difficulty breathing. Talk with your doctor if you experience side effects from B12 nasal gel. Because there isn't a tolerable upper intake level established for vitamin B12, it's difficult to determine how much is too much. However, Mayo Clinic says that doses of up to 2,000 micrograms from B12 supplements have been safely taken daily for up to 2.5 years in people with vitamin B12 deficiencies. Because a variety of factors are at play (medication interactions, B12 absorption rates in your body, etc. ), it's best to get a doctor's recommendation for individualized B12 supplement or injection needs, especially if you have pernicious anemia. Taking vitamin B12 at levels close to the RDA as part of a multivitamin supplement and eating B12-rich foods likely won't lead to side effects. Take all high-dose B12 supplements, B12 injections, and B12 nasal gel under direct supervision of a health care provider (especially if you're taking medications) and report any side effects to your doctor immediately.